Home to the University of South Carolina Gamecocks is Williams-Brice Stadium, recognized as one of the finest facilities in all of college football. Carolina annually ranks among the nation's leaders in attendance and Gamecock fans are regarded as some of the most loyal in the country. Williams-Brice Stadium, formerly Carolina Stadium, was first constructed in 1934 by the Works Progress Administration (WPA). Then it seated 17,600. It has undergone a number of expansions and revisions over the years, with the largest prior to the 1982 expansion coming in 1971-72. A bequest from the estate of Mrs. Martha Williams Brice helped boost the capacity then from slightly more than 43,000 to more than 54,000. Mrs. Brice's husband, Thomas H. Brice, was a Gamecock football letterman, 1922-24, and her family operated the Williams furniture Company in Sumter. She left a substantial interitance from the Williams Furniture fortune to her nephews, Thomas W. and Phillip L. Edwards, much of which they passed on to the University of South Carolina. That included a bequest for the stadium project. The name was officially changed from Carolina Stadium to Williams-Brice Stadium in dedication ceremonies during the September 9, 1972 opener with Virginia. One bag that is clear plastic, vinyl or PVC and does not exceed 12" x 6" x 12" -- A logo no larger than 4.5" x 3.4" can be displayed on one side of a permissible clear bag. An exception may be made for medically necessary items after proper inspection at West Premium Gate 21, Southeast Gate 55 and East Gate 81. The University of South Carolina Athletics Department asks that you please adhere to the following FAA policies, per the NOTAM document concerning flight restrictions for sporting events. No flight operation may take place within 3 nautical miles, nor up to 3,000 feet around the perimeter of the stadium, from one hour prior to the start of the event until one hour after its completion. These restrictions also apply to all unmanned or remote controlled Drone aircrafts. Failure to comply with these restrictions will result in the appropriate legal response from law enforcement officials. Individuals with disabilities may use the elevators located throughout Williams-Brice Stadium (see stadium diagram for elevator locations). Early gates (West Premium Gate WP21, The Zone Z48, East Pass Gate E70, and Student Gate ST96) will open two hours prior to kickoff. All other gates will 1-1/2 hours prior to kickoff. Be advised that all persons, upon entering property/stadium, consent to a search of their person and property at the time of entry and during their stay on the premises. Williams-Brice Stadium has a no-re-entry policy; tickets can only be scanned for use once. The Ticket Office is located in the Bignon Gameday Center, adjacent to the Northeast entrance of the Springs Brooks Plaza at Williams-Brice Stadium. 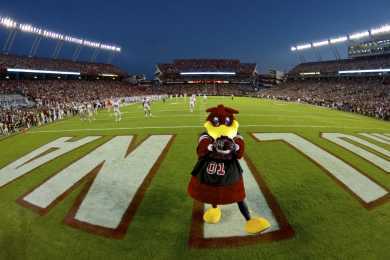 Tickets cannot be resold on any University-controlled grounds, including, but not limited to, Williams-Brice Stadium, the Springs Brooks Plaza and Gamecock Park. Lost, stolen, or counterfeit tickets are not the responsibility of management. There is a NO refund or exchange policy in effect on all tickets. Management reserves the right to refuse admission. Every person, regardless of age, must have a ticket to the event. The holder must present ticket upon request. It is the responsibility of the ticket holder to be familiar with all ticket usage rules and regulations, which can be found on the back of each ticket. Additional tickets can be purchased through the Ticket Office if available. The University of South Carolina is a tobacco-free campus. The policy, which includes the ban of electronic cigarettes, is in effect at all University of South Carolina facilities, as well as surrounding property owned, leased, or controlled by the University. These restrictions apply to all areas of Williams-Brice Stadium. We request and appreciate your adherence and compliance with this University policy; violators are subject to ejection. The South Carolina Athletics Ticket Office WILL CALL will be open four hours prior to game time. Will Call is located on the northeast corner of the Springs Brooks Plaza, in the Bignon Gameday Center, adjacent to the East gates. 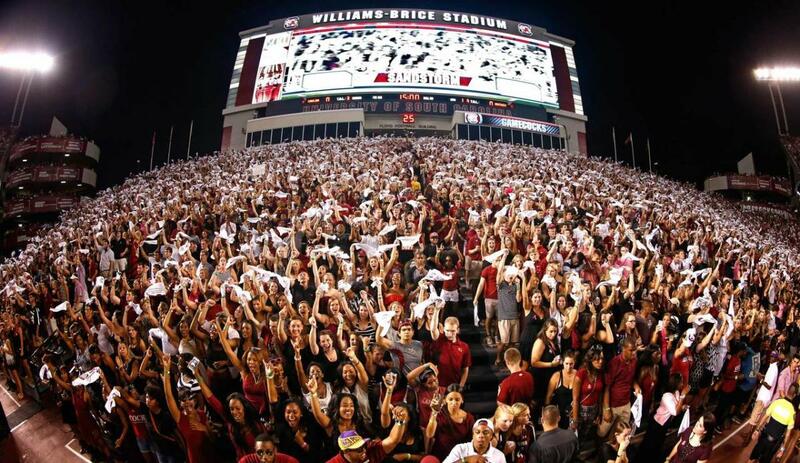 The possession or consumption of alcohol of any kind in Williams-Brice Stadium is expressly prohibited by University policy. Patrons in violation will be ejected and may be subject to arrest. In an effort to encourage an enjoyable experience for all fans, persons who are intoxicated will be denied entry into the stadium, regardless of ticket possession. Buses will be accommodated on a first-come, first-served basis in the South Carolina State Fairgrounds. Drivers should use the entrance located at Gate 12 on Rosewood Drive. Caterers should have proper parking permits to be admitted to private tailgate areas. Permits will not be available from Gamecock Club offices and should be secured with the client. In the event of inclement weather approaching Williams-Brice Stadium, public address and video announcements will be made to update fans on the situation. Should a lightning strike occur within 8 miles of the stadium, play will be stopped immediately. Play will resume 30 minutes after the last strike occurs within the 8-mile threat radius. Fans are encouraged to exit the venue and seek shelter in their vehicles during weather delays. All ticket stubs should be kept for re-entry into the stadium after the weather threat has cleared. Updates may also be communicated via 107.5 The Game, GamecocksOnline, Twitter, and Facebook. Golf cart shuttle service from the Fairgrounds will be available for those with disabilities beginning 2-1/2 hours before kickoff and will continue until the game begins. The pickup location is located in the Fairgrounds white section by row 10 nearest the South Carolina State Fairgrounds entrance. The golf cart shuttles will transport guests to the north corners of Williams-Brice Stadium. Golf cart shuttle service from Gamecock Park will be available for those with disabilities beginning 2-1/2 hours before kickoff and will continue until the game begins. Pickup locations are located along the Garnet Way at Quads 1 and 3. Golf cart shuttle transportation to the stadium plaza is available up to one hour prior to kickoff, or as traffic permits, at which point guests will be dropped off at the Premium North location of Gamecock Park. Return transportation for those with disabilities to the Fairgrounds and Gamecock Park will also be available after the game. Return service begins with five minutes left in the event, until there is no one waiting at the golf cart shuttle stations. Be advised that both pedestrian and vehicular traffic are extremely heavy following the game; therefore, the wait time for golf cart shuttles may be extensive. There are a limited number of spaces available for disabled Gamecock Club members in each lot. Requests for disabled parking should be made in writing, and accompanied with a copy of the state-issued handicapped placard, to South Carolina Department of Athletics, Football Game Parking, 1304 Heyward St., Columbia, SC 29208. Disabled parking services are subject to change, visit GamecocksOnline.com for up to date information. Pregame shuttle buses will pick up fans from the Colonial Life Arena parking lot and transport them to the main gate of the South Carolina State Fairgrounds. At the conclusion of the game, the shuttle bus will pick up from the main gate of the Fairgrounds and transport patrons back to CLA. Shuttle services are subject to change, visit GamecocksOnline.com for up to date information. For the safety of all concerned, the use of these motorized vehicles (other than those authorized) will not be allowed by fans in the vicinity of the stadium on game days. As a reminder, S.C. highway laws do not allow the use of golf carts on roadways outside of a four-mile radius from the registered address or place of business of the registered operator and must be permitted by the S.C Department of Motor Vehicles. Neither the University of South Carolina nor the Gamecock Club will be liable for loss or damage to vehicles parked or contents on South Carolina properties as well as surrounding property owned, leased, or controlled by the University. Due to space constraints, limousines are not allowed in Gamecock Club controlled parking areas. Drivers should drop off guests on Key Road, near Williams-Brice Stadium, and seek parking in public lots made available by area businesses. Media parking is located on Key Road. Members of the media should request parking credentials from the University of South Carolina Athletics Media Relations Office. For more information, please call 803-777-5204. RV Parking is available in the South Carolina State Fairgrounds located on the east side of Assembly St. and at Gate 12 on Rosewood Drive. Please call the Fairgrounds for specifics at 803-799-3387. The gates to lots within Gamecock Park will open six hours prior to kickoff, but no earlier than 8 a.m. All other parking lot gates will open five hours prior to kickoff, but no earlier than 8 a.m. Vehicles should be removed no later than two hours after the conclusion of the game, or risk being locked in until the following business day. Restrooms will be available for use once parking lots open in Gamecock Park, along the Garnet Way, and throughout the Fairgrounds. Restrooms are also located on the east side of the Springs Brooks Plaza at Williams-Brice Stadium. 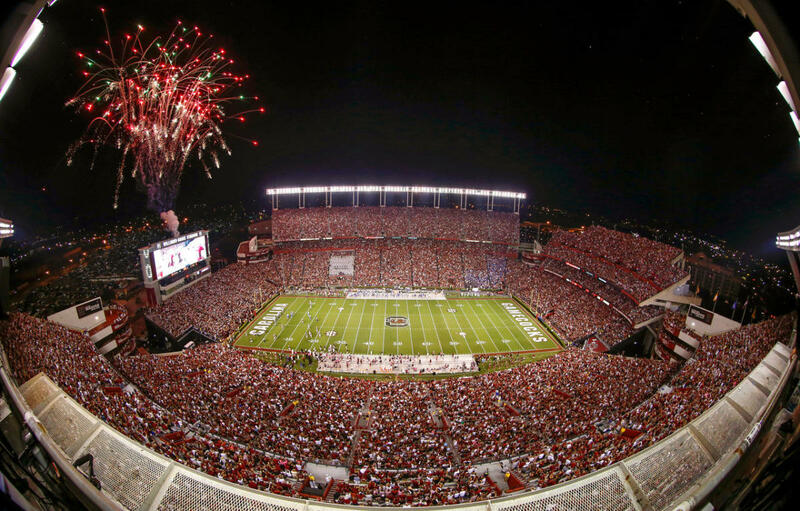 The University of South Carolina makes every attempt to ensure fans are able to enjoy the festivities surrounding the game. If you observe threatening or illegal behavior, do not hesitate to contact law enforcement or event staff security. If you see something, say something. Uniformed officers from various law enforcement agencies, and event staff security, are stationed throughout the tailgating areas, game day facilities, and Williams-Brice Stadium for your safety. Game day law enforcement personnel are coordinated by the USC Division of Law Enforcement and Safety and can be contacted at (803) 777-4215 or text "USC" along with your issue and location to 69050.